“Put your money where your mouth is” has been a rallying cry for gamblers since time immemorial. Basically, it means if one is so confident about whatever it is they are asserting, they should put some money down — they should bet on it. Many horseplayers think along similar lines. They will pass (I tried that once in 1992) or bet less money on races they are less sure of and wager with gusto on the events they like. This got me wondering: Is it possible to determine the efficiency of pari-mutuel odds based solely on the relative handle? That speculative markets like pari-mutuel pools are generally efficient is hardly arguable. In fact, on Wall Street, there’s a name for it: the Efficient Market Hypothesis (EMH for short). Formulated in the early 1960s by Eugene Fama, a professor of finance at the University of Chicago Booth School of Business, EMH asserts that speculative markets reflect all that is known and can be analyzed, while rapidly assimilating new data on various traded assets. In racing parlance, this means that each horse in a race is, for the most part, fairly priced. Again, let me stress that we are talking in generalities here. Obviously, Wall Street traders and racetrack gamblers encounter underlays (overvalued horses/financial instruments) and overlays (undervalued horses/financial instruments) every day. That said, those of us who are honest, i.e. not in politics, know that the concept of value betting is much tougher in practice than in theory. But what if the pools themselves could tell us how predictable a particular race was? What if we knew in advance — without even handicapping — whether a particular steed was a good or bad favorite? Well, based on my preliminary research, we can. I examined the June 30 and July 1 result charts from nearly every thoroughbred track in North America with one simple goal: to find out if the money wagered on a particular race was an indication of that contest’s efficiency or predictability. Specifically I looked for the one event on each card that generated the highest straight pool (win, place and show) handle. I then recorded the odds of each winner and noted whether or not it was the favorite. 50 percent winners and a positive ROI… think about that for a second. And while you’re still on the toilet (hey, it’s where I do my best thinking), remember that, on average, favorites win only about a third (33.3 percent) of the time and produce a return of just 85 cents on each dollar wagered (-15 percent ROI). What’s more, the races in my study ran the gambit — from graded stakes events to lowly maiden claimers. At Monmouth Park on June 30, for example, there were two stakes races — the kind of high-purse races we bettors supposedly flock to — on the card, yet it was the fourth event of the day, a lowly maiden claiming affair, that generated the most interest among punters. 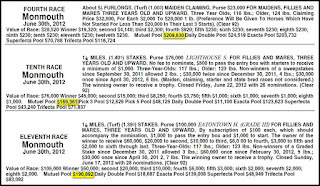 Field size didn’t always matter either, as was proved at Emerald Downs on July 1, when the fourth race, consisting of seven betting interests, produced a larger handle than the second race (eight entrants), third race (10 entrants) and sixth race (nine entrants). Interestingly, the third race was comprised primarily of first-time starters, which adds credence to the thesis that the handle reflects bettor confidence and, as a result, the efficiency of the odds. Now, clearly, more research needs to be done, but the initial implications of this study are stunning. If it’s true that more wagering leads to more formful results, it would seem that the opposite might also hold true — that less wagering leads to more chaotic results. Also, rather than focusing on the race with the highest handle of the day as I did (which is an after-the-fact observation), one might instead establish handle “pars,” averages to help one determine unusually heavy or light betting activity. Armed with such knowledge, players could spot efficient and less efficient betting markets with relative ease. The possibilities, it seems, are endless. Very seldom does he ever end up with a positive ROI for the day. can't say less wagering brings "chaotic" in a bad sense. Had some success in the early days of simulcasting when some facilities had seperate pools...if you were lucky enough to find disparaty on your selection you could find some value[chaotic] payouts. From an individual betting scenario on a day's card, one would not know what race in advance of the nine races would be the race that provides this biggest pool factor. Even within a card, say the sixth race, and it was the largest it would not be any factor in that possibly the next four races might contain the largest pool. This is like saying that the only thing one has to do is determine the three races a day the favorite would win and pass the other six to 7 races on the card. ANONYMOUS #1: Most, if not all, tote board watching is a waste of time. Numerous studies have shown that betting trends don’t mean much. Seeking trends persists because there is a mystique to it — folks love believing that a select group of people “controls” the results of certain activities. Dan Brown — and this is not a knock, I greatly enjoy his books — has made a career out of that fact. ANONYMOUS #2: You’re closer to the spirit of this piece and you brought up a great example. 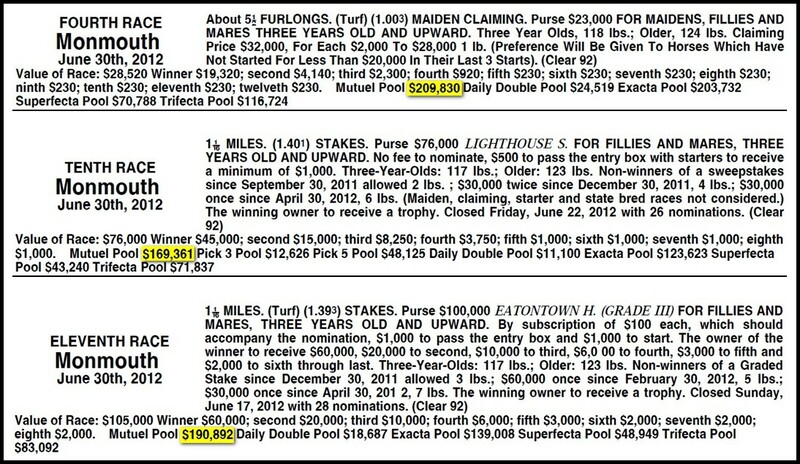 For those who don’t know, years ago simulcast events (with few exceptions) had their own pools and one way that a savvy player could make money is by looking for discrepancies between the home track pool (where one was betting) and the host track pool (where the race was taking place). Invariably, the host track was a bigger facility and featured a more efficient line. Hence, if one saw Horse A was 2-1 at the host track and, say, 7-2 at the home track, a potential betting opportunity was present. By the way this situation is still true on many international events and is especially meaningful where there is a “hometown hero” competing. For example, I’m pretty sure if there were separate pari-mutual pools, Star Guitar would draw a lot more wagering dollars in Louisiana than he would in NY should the son of Quiet American compete at Belmont Park (Star Guitar is 22-for-28 lifetime in LA at the time of this writing). ANONYMOUS #3: I see your point — I thought I addressed it in the piece — but you’re missing the big picture here (again, I’ll take the blame for not making it clear). The study was less about capitalizing on the race with the highest handle and more about the efficiency of betting markets. If, in fact (and the question is still open to me — 64 races over two days is not sufficient proof) more or less betting action on a race leads to greater or lesser efficiency, the ramifications are incredibly meaningful. For example, if the odds in a race drawing very little action are NOT efficient, it gives value bettors a tremendous edge. For a guy like me, who makes his own line, such information is worth its weight in gold. Look, you're right in that inefficiencies can certainly result from "stiffing the favorite," but higher grade races bring their own inefficiencies to the table. For example, how often do you think a horse shooting for the American Triple Crown (like I'll Have Another this year) is fairly priced in the Belmont? The answer is practically never, because the reputation of Derby and Preakness winner trumps rationality 99-44/100% of the time. Derek, I love how you approach betting, with a curious academic aspect. Totally different to how I approach it but very interesting never the less. There are definitely still disparities to be taken advantage of on international racing. I backed Henrythenavigator in the BCC at 7/2 at home back in 2008...oops! I hear you Ciaran (FINALLY, a name, LOL!). The European markets were instrumental in my playing Red Rocks in the BC Turf a few years ago. You can examine anything you like but horse racing is by far the most difficult. To many factors, bias, conditions, track suface, jockey, post position and the list goes on and on. I bet mostly online and sometimes you have to find a track that suits your skill. Lately have been betting presque Isle and the races that Pablo Morales is riding. He is a jockey that knows how to win even on a non favorite. Someone should tell the horses what their odds are at post time. "Someone should tell the horses what their odds are at post time." If the implication here is that the odds are meaningless, you couldn't be more wrong.